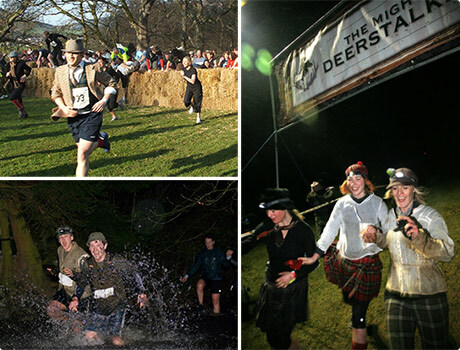 In a month’s time (21st March) it’s another of those eccentric and uniquely British events, The Mighty Deerstalker, held just south of Edinburgh, in and around the town of Innerleithen. It’s an “adventure run” with a difference, all the racers are dressed up in tweed :) The Deerstalker is Fun Run meets Fell Race meets Hellrunner meets Tough Guy. You can expect water jumps, log balance bars, prickly tunnels and cargo nets over the 2 distance options of: 5 km (ish) and 10 km (and a bit). Cheers for the link okjerome. Feb 14	This entry was posted in Bizarre, Events I missed, Walking by cookie. Bookmark the permalink. I’m taking part for the first time this year and I already have the fear – just over a month to go! I’ve got my Deerstalker hat on so I can be mentally training whilst I’m at work.